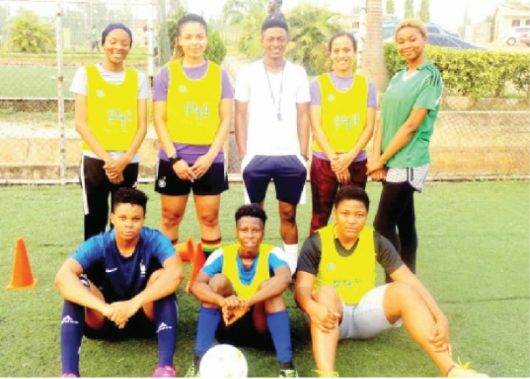 As part of activities to mark this year’s World International Women’s Day billed for March 8, Phoenix Football Academy is organising a one-day 5-Aside women football competition in the Federal capital territory, Abuja. The competition which will hold on Saturday, March 9, is aimed at creating awareness about women participation in football/sports and the need for equality in all human endeavours irrespective of gender. Speaking in an interview, the co-organiser of the competition, Lilian Suffer from Germany, said the completion is aimed at changing perceptions about women participation in sports and the need to encourage women to take up career in any sports especially football. Ms Suffer who said that Nigeria has become her second home, explained that registration for the competition is free whereas medals and prizes will be won by players who distinguished themselves in the competition. Tagged “Just Kick It”, Suffer added that although this is the maiden edition of the competition, the academy will make it an annual championship to signpost the achievements of women in football and sports in general. “Nigeria is my second home and I have always been around because I play football and it is from my findings that I observed that women are not coming out to play football in Nigeria. It is on this basis that we are organising women 5-Aside tournament in Abuja to mark the International Women’s Day (IWD) here in Nigeria. It is tagged ‘Just Kick It’ and it will hold on the 9th of March this year, the day after the IWD. We think it is a good day to highlight all the women in sports, create a platform for female to come in and play football. “We expect eight teams. We actually know that there are a lot of teams in Abuja that are playing regularly and we want to bring them together. So we are expecting 8 teams that is a total of 80 women for the championship. There will be trophies and medals for the winners and other gifts for the most valuable player and the rest of them. We are also looking for sponsors to help us get other prizes so that we can motivate the women very well. “We want to make it a regular tradition so that it will become our way of celebrating International Women’s Day in Nigeria through football and sports because they are the best way to bring a lot of women with different background together and have fun, network and even create a community. For the women, it is important that we don’t fight one another rather we should support and strengthen one another. Football is a great way to do this, it unites us. “There is no registration fee because we just believe that there should not be any barrier for any woman to achieve her dream in anything not just football. Money is not an excuse; registration is totally free. The deadline for registration is 6th March so we can have enough time to put things in order and come out with the fixtures. “It is a one-day competition. Just on the Saturday of March 9. It is a-day event, we want to come together and celebrate and we believe it is going to be a great celebration. The venue of the competition is Planet Futsal, Utako, Abuja.